Several years ago, my friend Virginia called to invite me to a concert. Martin Sexton, one of her favorite singer-songwriters, was playing that night at the Boulder Theater, and Virginia had an extra ticket. Would I like to go? So I joined Virginia that night, and am I glad I did! 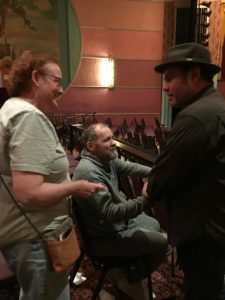 Martin Sexton came out on stage – a solo guitarist and singer – and launched into a song I immediately thought of as the “happy song.” I loved it! Such joy! Such a life-affirming song! I sat spellbound through the rest of the two-hour concert. How had I not known about this talented songwriter and even more deeply gifted performer? His pyrotechnic singing (complete with an amazing and effortless falsetto) and his virtuoso guitar playing and phenomenal beat boxing were out of this world. I could not believe what I was seeing and hearing. Indeed, I thought that if I had merely heard a recording of Martin Sexton, I wouldn’t have believed one person alone could create such joyful music. But there I was seeing with my own eyes that he was the only one singing, playing guitar, and creating his own percussion section through beat boxing. As soon as I got home that night, I found a great video clip of Martin Sexton performing the song “Happy” at a Colorado music festival. For days afterward, I sang the song around the house — for I know of that joy and happiness with a mate that the song captures. The song rang – and still rings – so true to me. “Happy” is a celebratory slice of life, as the singer revels in a moment of unbridled happiness with his mate. It’s a Sunday morning, and they’re enjoying coffee, breakfast, conversation, a dream of true love realized. “Hot damn, I’m a happy man!” Martin Sexton sings with gusto. I love it! If you haven’t experienced his music already, you owe it to yourself to check it out. Start with the video clip below to see him in action, and if you like what you hear, consider buying one of his many albums. Live Wide Open is a great place to start. It features many of his own original compositions and one of his inimitable covers: “Amazing Grace.” Other recordings include Black Sheep , Solo , Fall Like Rain , and his most recent album, Mixtape of the Open Road . The albums are great – but the absolutely best way to experience Martin Sexton is to see him live in concert. You can check out his tour schedule on his website – and when you see a concert near you, run (don’t walk) to get a ticket. Hailing from Syracuse, New York, as the tenth of twelve children, Martin Sexton got his start as a street musician – a busker – in Harvard Square, where he sold 15,000 copies of his first self-produced album out of his guitar case. Slowly the word got out about this phenomenal musician – and now he tours nearly constantly, sharing his beautiful gift of song. Learn more about Martin Sexton and his work at the NPR page featuring his work, including clips from his many performances on West Virginia’s Mountain Stage. You’ll be glad you did. Watch:Watch the video clip of Martin Sexton performing “Happy” at a Colorado music festival. Image credit: Linda, Jim, and Martin Sexton at the Boulder Theater in Boulder, Colorado. Photo by Virginia Holder. Linda, thank you for bringing me a little slice of joy when I open StoryWeb each week. Always something to expand my horizons or remind me of an old friend. Happy new life anniversary to Jim! And thanks, Linda, for introducing me to Martin Sexton a few years ago.